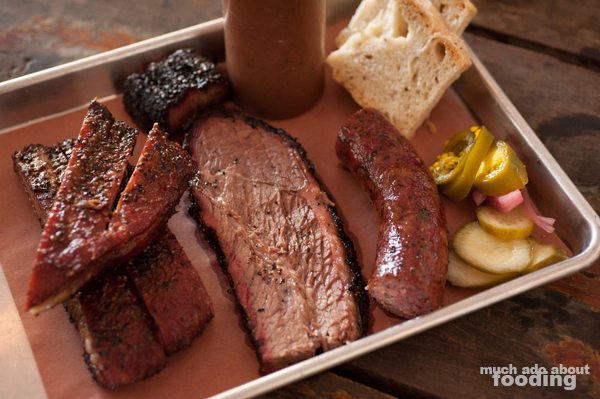 Trust the locals when you're in the town and are looking for a dish they're known for - when in Texas, you ask them where to find the great non-touristy barbecue. 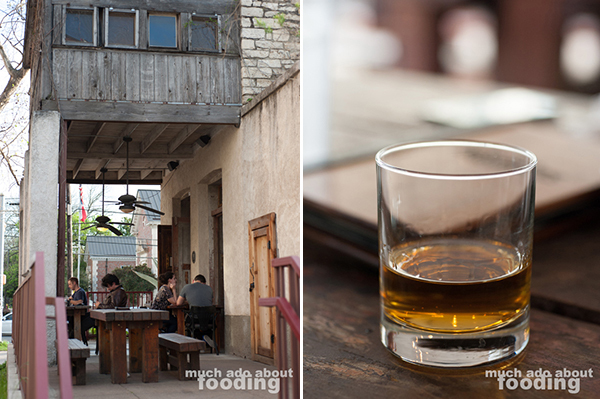 When a friend visited us in town, he got the hat tip from a friend who was told by locals to visit Freedmen's Bar for tasty brisket and a good time. 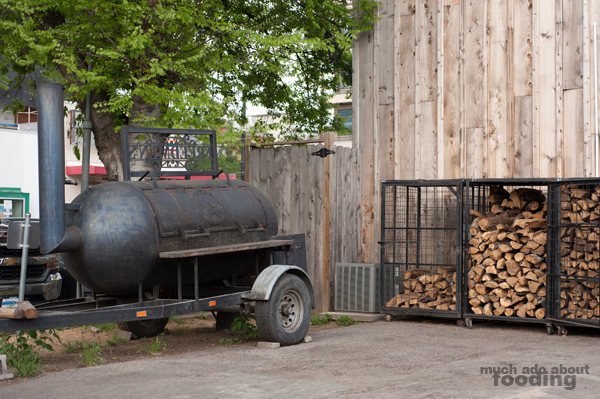 We were curious too so made our way to the spot that touts both a dedication to barbecue as well as to whiskey - two things we enjoy quite much. With more than 160 whiskeys on hand, Freedmen's sure has a lot to consider and not only do the food and bar menus impress but the venue itself also does. 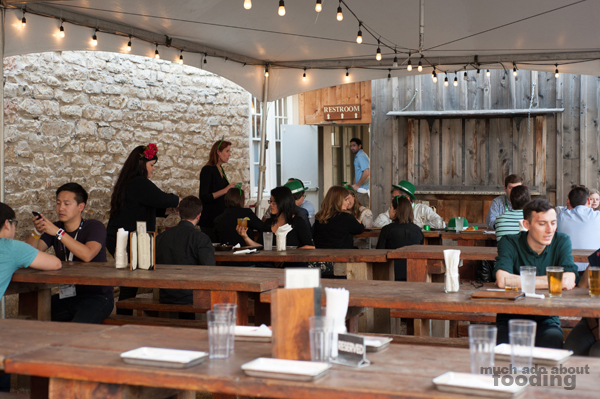 The smokehouse resides in a historic Austin building that once served as a home, church, publishing house, and even grocery store; it is completed by a cocktail lounge and beer garden these days. The building's name is a tribute to its residents when it became the center of Austin's first "freed man community" (Wheatville) and was built in 1869 by freed slave George Franklin. It became a central location for other businesses and ventures from that point forward, including housing the influential Reverend Jacob Fontaine who created some of Austin's earliest churches and was involved in one of the nation's first black newspapers, The Gold Dollar. The history baked into the building added to the overall charm of our dining experience as we saw much of it preserved in the structure and paid homage to via signage. Though going from a house with much social progress history behind it to a dining establishment seems less impactful, I would think that future communities will appreciate the use of the building to perpetuate the fine art of Texan barbecue. In keeping with the focus on history, Freedmen's Bar now serves up a side of their beverages menu to old-fashioned drinks. You'll have plenty of opportunity to get a variety of whiskies neat but if you don't know what you like, your waiter/waitress can help you pick one out or you can select a whiskey flight. For those with an eye on cocktails, the ones we tried were the Freedmen's Gin & Tonic ($8 - Aviation gin, house-made tonic, lime) and Ol' Schmokey ($9 - Evan Williams bourbon, smoked orange, smoked pecan bitters, oak smoke), the restaurant's spin on old-fashioned drinks. The gin and tonic was extremely easy to take down as it was smooth with a little zestiness from the lime; it was absent of the typical bitterness that tonic water can bring to such a cocktail. 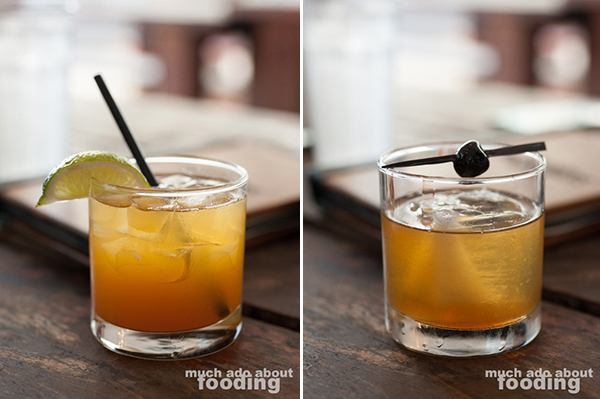 The Ol' Schmokey is their riff on an Old Fashioned and highlighted by their own smokehouse's smokiness in some ingredients. I really enjoyed this one too for its musk and balance. 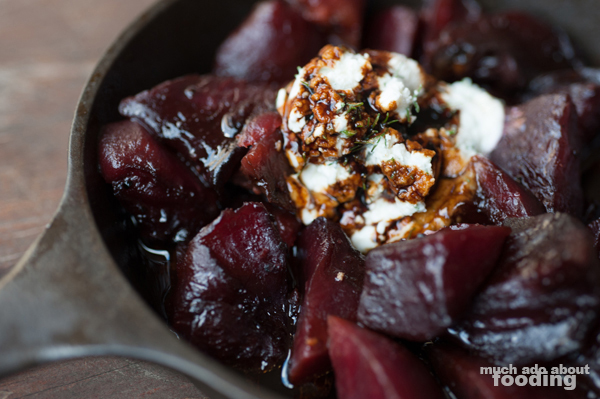 We prepared our stomachs for the incoming barbecue with an appetizer order of the Smoked Beets ($9.50 - herbed chevre, balsamic glaze), another area where they decided to take advantage of their in-house smokehouse. While the combination of beets with chevre was a good choice, the tart zip from overwhelming balsamic made the overall dish hard to eat much of. We picked at this one throughout the night as it just needed to be tackled slowly. The smokiness, however, was a lovely treatment to the beets as it kept the dish on the savory side. The star of the show came from a selection of many meats. Since there were three of us that night, we decided to go whole hog (though not literally) and load up on about half a pound or more of meat per person. That included grabbing a half-pound of Brisket ($10/half lb - fatty, lean, or mixed), fatty of course, and the Holy Trinity Plate ($25 - brisket, pork spare rib, and house-made sausage served with assorted housemade pickles, barbecue sauce, and focaccia bread). 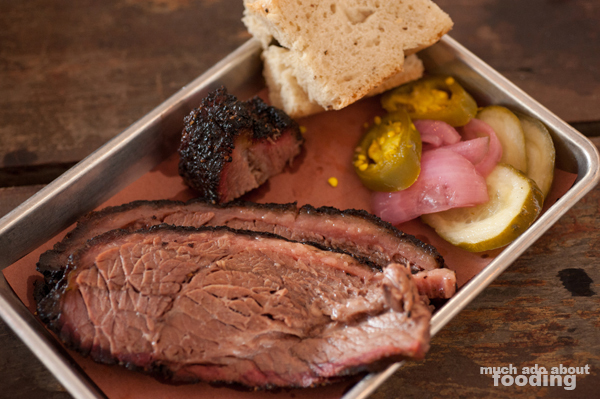 Each metal tray that came out also treated us to a small bit of burnt end to round out the orders beautifully. The brisket was extremely tender and gloriously fatty as we desired, not even needing any of the barbecue sauce that accompanied it. We found the ribs to be quite tender as well and seasoned well with the black pepper brushed on the surfaces though not nearly as satisfying as the brisket. As for the sausage, it had a good balance of flavors in its mixture which we've found other barbecue restaurants have fallen short of doing when it comes to sausage. It was neither salty nor dry; we'd all come back for more of those links. If you needed barbecue sauce as well, a full squeeze bottle came with the plate for additional saucy goodness but with how juicy each meat was, it wasn't necessary. Oh and did I mention how lovely the pickles were? 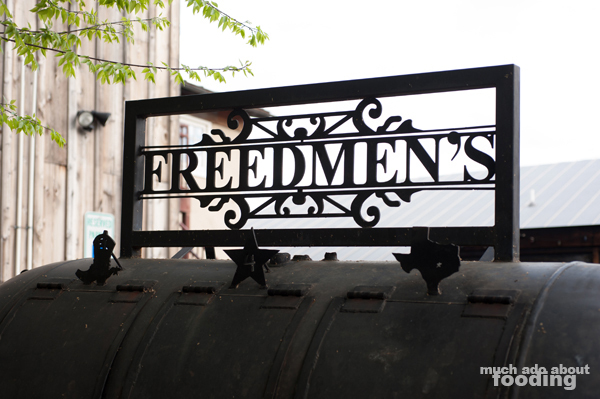 If you want to stumble into Freedmen's Bar, find them on 2402 San Gabriel St, Austin, TX 78705 and be very mindful of the limited parking behind the restaurant. You might be better off going across the major street to the neighborhoods where there are parking meters. 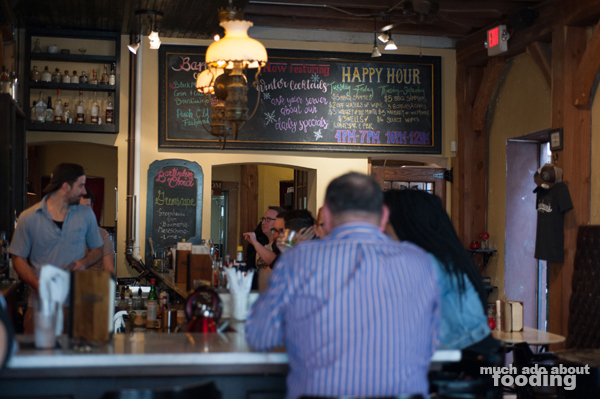 Also, make note that Tuesdays-Fridays from 4-7pm are the Happy Hours when you can get $2 Lone Star on draft, $2 Pabst Tallboys, $3 Whiskey of the Month pours, $5 BBQ sandwiches, and more (not that you need more reason to go)!